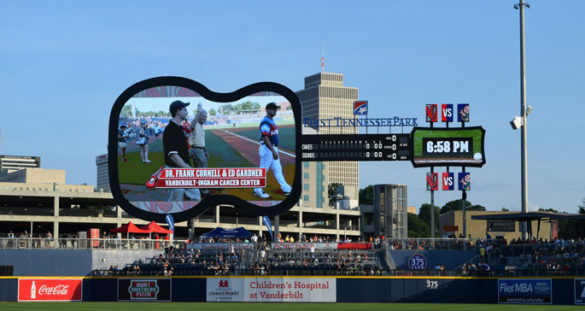 At the early summer event in First Tennessee Park, the team and fans honored VICC patient Ed Gardner and his physician, R. Frank Cornell, M.D., M.S., assistant professor of Medicine and clinical director of Plasma Cell Disorders. Gardner, 69, is an Army veteran and former music electronics sales executive who was diagnosed with multiple myeloma in 2014. His only symptoms were some unusual dental problems and the fact that minor wounds from lawn care weren’t healing well. Blood tests at the Veterans Administration (VA) hospital revealed a blood disorder in which multiple myeloma cells (abnormal white blood cells called plasma cells) build up in the bone marrow. Gardner remembers the bleak prognosis from his original physician. However, Cornell, who treats patients at VICC and the VA, offered Gardner treatment with three drugs as part of a clinical trial. “Ed was one of my first patients on a clinical trial that I designed called the PROTECT study. It’s a Cardio-Oncology and Hematology collaboration and the goal is to monitor the potential cardiac toxicities of certain chemotherapeutic agents for the treatment of multiple myeloma,” Cornell said. Gardner’s form of the disease is aggressive. However, with treatment on the clinical trial he achieved remission. Cornell then treated Gardner with a stem cell transplant to deepen the remission, and he remains in remission on a post-transplant maintenance drug. Gardner said he was happy to be recognized at the Nashville Sounds event and encourages other cancer patients and families to have a positive attitude. “I know cancer is a very serious thing, but the medical research has come so far. Three years ago they told me I had three years and now in those years new drugs have been developed. I’m on daratumumab (a monoclonal antibody) and it wasn’t even available when I started treatment,” Gardner said. Support and appreciation from organizations like the Nashville Sounds are vitally important, Cornell said.